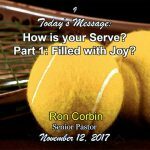 How is your Serve? Part 3: Filled with Humility? How is your Serve? Part 2: Filled with Gratitude? How is your Serve? Part 1: Filled with Joy? 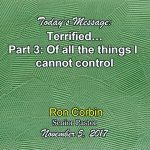 Terrified… Part 3: Of all the things I cannot control!